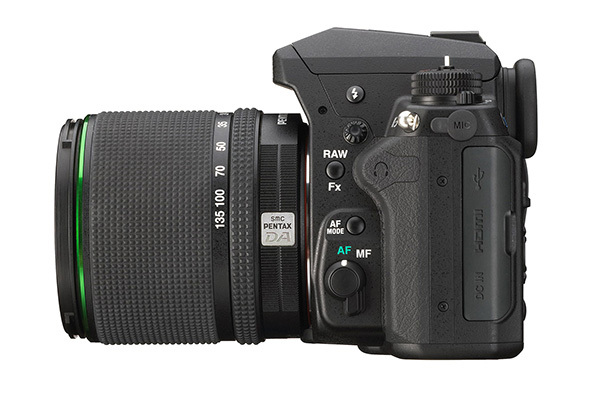 It’s not often that a manufacturer launches a flagship DSLR that features an APS-C sensor. But instead of directly competing against established full-frame DSLRs from the likes of Canon and Nikon, or creating the need to develop a range of new lenses, Pentax may have actually made a very smart move with this decision. Building on the robust design and features set of the Pentax K-50, the K-3 provides a more advanced proposition likely to appeal to enthusiast photographers. But is there enough to tempt newcomers into the Pentax system when there’s some very stiff competition in the advanced enthusiast DSLR market? The K-3 certainly isn’t holding back when it comes to features, including a new 24MP CMOS sensor that’s marginally smaller than that in the K-50. But with the removal of an anti-aliasing filter and addition of the recently developed Prime III image processor Pentax claims the K-3 can deliver high resolutionlow noise images within an ISO range of 100-51,200. For sports and action photographers continuous shooting is possible up to 8.3fps in bursts of up to 22 RAW files or 60 JPEGs – more than enough for any situation. Continuing the trend for high performance features aimed at action photography, the K-3 uses a new SAFOX 11 AF module with expanded image coverage thanks to 27 AF points. All bar two of these are the sensitive cross-type sensors positioned in the central portion of the frame. Autofocus has a large working range of -3EV to +18EV, meaning the AF system should function well in both low light and bright conditions. And the 100% viewfinder provides a full view of the scene being photographed, so you can be confident that what you see is what you get when it comes to composing shots. And to ensure that your shots are not only well composed but are also sharp when shooting in difficult situations, the K-3 includes in-camera image stabilisation (IS). This system moves the sensor in the camera rather than glass elements within lenses, which means you can use the feature with all lenses and not just the ones with built-in IS. This feature allows you to shoot at slower shutter speeds than you could normally and is particularly useful when using long telephoto lenses and taking shots in low light. The K-3 is the ideal outdoor photography companion thanks to the robust magnesium alloy construction with 92 seals in parts of the camera body. This means the K-3 is dust and weather resistant, with the ability to operate in extreme conditions with temperatures as low as -10°C, which isn’t unheard of in the UK. The overall build quality of the K-3 is very good, and it feels solid. The angular and boxy design is reminiscent of Soviet SLRs from the 1980s though, so the K-3 is unlikely to win any prizes for its looks. But it’s not the way a camera looks that’s important is it? Despite these design quirks the K-3 feels fairly good in the hand. The square shape of the body means the bottom-right corner of the K-3 can dig into the palm of your hand. A vertical battery grip might alleviate the problem, but at the time of writing a grip is only available with the limited edition silver version of the K-3, which is available for £1399 without a lens. This is very expensive considering the standard black K-3 is available with an 18-55mm kit lens for £1199. It’s highly likely that the grip will become available separately at a later date. Beyond the look and feel of the camera, the control layout is very good with just the right balance between thoughtfully positioned direct access buttons and menu-based controls. That said, the menu system isn’t the most intuitive, and as this very menu has been a staple feature on Pentax DSLRs for a number of years, could it be time for a change to something more intuitive? Fortunately the direct access buttons make changing the most commonly accessed settings quick and easy. Turn to the back of the camera you’re greeted by a large 3.2in 1037k-dot LCD screen. Images displayed here are crisp and detailed thanks to the high resolution screen. For photographers with a heavy shutter finger, or those who like to have a spare memory card in their camera, there are two SD card slots. By using the optional FLU Card (a wireless-enable 16GB SD card), you can use your smartphone to change settings, view a live feed from the camera and download images to your phone. To do this you will, of course, need a smartphone and app. Transferring images to a phone may be useful on some occasions, but for most people downloading images using a traditional cable is the most likely option. Even now many DSLRs only have a USB 2.0 connection, but to speed up the tedious job of downloading images the K-3 features a USB 3.0 connection. If your computer doesn’t have USB 3.0 ports, you’ll be pleased to hear that it is backwards compatible with USB 2.0. Despite being a DSLR with an advanced set of features aimed at more advanced enthusiast photographers, the K-3 still features a full auto mode and a number of fun photo filters that can be applied to JPEG images in-camera. These features will all appeal to beginner photographers, but with no scene modes there’s a clear leaning towards those looking for more control of their photography. With the removal of the optical anti-aliasing filter, the K-3 should produce sharper images oozing with detail. During our tests we turned the anti-aliasing simulation filter off so we could fully assess image quality, including whether or not moiré was an issue in high detail areas. We found that images were indeed sharp and full of detail, although it’s difficult to judge the full potential of the camera with a kit lens. Considering the amount of detail that was captured with a kit lens, it’s safe to assume that a good quality prime lens would really do the camera justice. Moiré didn’t seem to be a problem in any of the images we shot, so having the option to turn the filter simulation off is a very welcome feature. Could this idea become the norm on DSLRs in the future? The K-3’s ISO performance is very good, with impressive and virtually noise-free results up to ISO 3200. Colour noise becomes more of a problem at this point than luminance, but this can be successfully reduced using raw processing software. ISO 6400 is as high as you’d want to go for most shots, but 12,800 could be useful in low light emergencies such as indoor shots without flash. the K-3 can be set as high as ISO 51,200, but to be blunt this setting is unusable. Unless, of course, you’re a paparazzi photographer and must get the shot. At this setting noise levels are so high the image is broken up with luminance and colour noise and resemble colour CCTV footage. Not a good look for a serious photographer! The Pentax K-3 is a feature-packed, well-built DSLR that is certainly an upgrade on the Pentax K-50. A significant increase in focus points, a higher resolution and improved weather-proofing are just a few of the improvements. The most interesting has to be the removal of the anti-aliasing filter from the sensor, and the implementation of a simulation filter in the form of microscopic sensor vibrations. It’s both an innovative and appealing feature for photographers looking for increased image detail and resolution. For current Pentax owners the camera offers real upgrade potential, but at £1199 for the 18-55mm lens kit it’s quite an investment for newcomers to the Pentax system. To be fair you get a lot of camera for your money, but handling is far from ideal for a flagship DSLR. The K-3 is respectable, but may struggle against the competition. This review was first published in the January 2014 issue of Practical Photography - download back issues here.